Short course “Analytical Methods in Forest Biorefineries”, Professor Antje Potthast and Assistant Professor Stefan Böhmdorfer, BOKU University (Austria), November 22. November 22, 10:30 a 17:30 hrs. “Workshop on Sustainable Use of Biomass in Chile”, November 25 afternoon, organized by the Karlsruhe Institute of Technology, KIT, (Germany) and the Technological Development Unit, UDT, (Chile). Goal of this workshop is to discuss various aspects of sustainable use of biomass in Chile and beyond. This includes – but is not limited to – the assessment of sustainable biomass potentials, current and emerging conversion technologies as well as use concepts, in particular those dealing with the challenges regarding biomass logistics due to biomass characteristics (high water content, low bulk density). 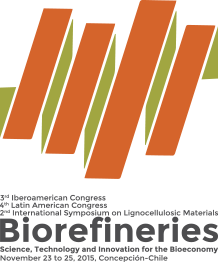 Moreover, future research topics, such as the social dimension of biomass use and the current German-Chilean project SeMoBioEnergy will be presented. industry. The idea of partnering and cooperation between Germany and Chilean biomass experts is at the core of the workshop.